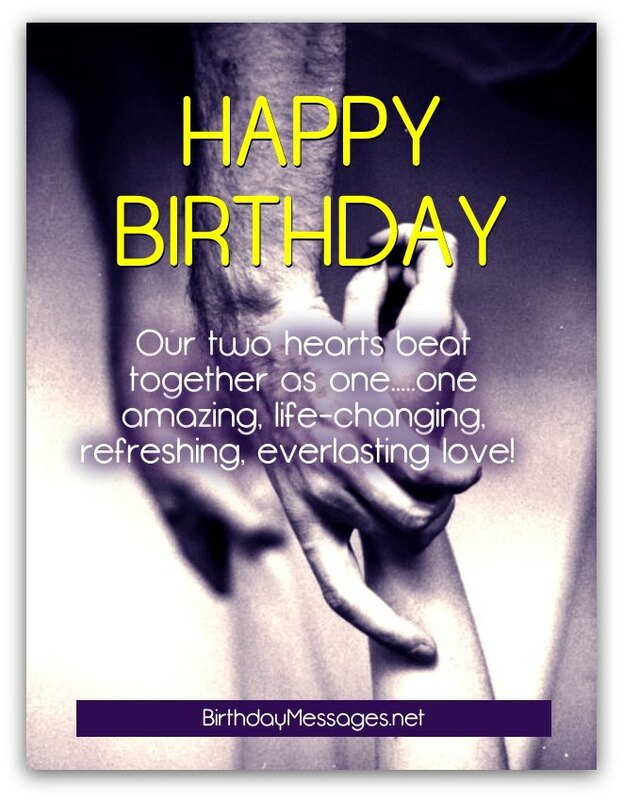 Romantic birthday wishes can lead to a birthday of pure passion. Who can resist romance? Nobody, especially when it comes with one of the birthday messages here. 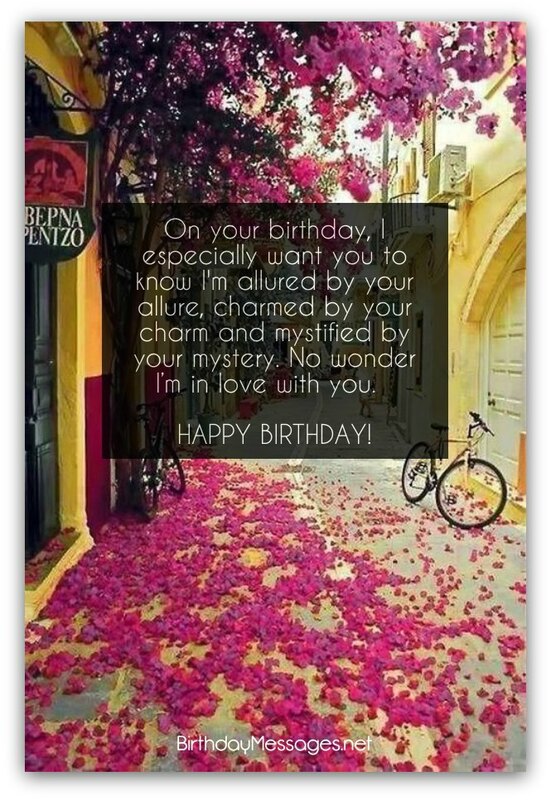 For your lover, boyfriend, girlfriend, fiancé, wife or husband, expressing your love with a beautifully written, unique love birthday message is the surest way to create true romance for what's probably the most special day of the year for them. Ready to make your choice? Then, start your search below. To ensure you're on the right track, click here to take a glance at a few tips for picking the perfect romantic birthday greeting. Every time I see your face, it's just like the first time I saw you. I fell in love with you at first sight and, every day since, I've fallen in love all over again. Happy birthday, my first love, my only love! On your birthday, I especially want you to know I'm allured by your allure, charmed by your charm and mystified by your mystery. No wonder I’m in love with you. Your touch, your warmth and your love make the world a beautiful place. They've made my world beautifully wonderful. I love you. Happy birthday! When I say I like everything about you, what I'm really saying is "I love you." When I say "I love you," what I'm really saying is I could not live without you. Happy birthday. I like everything about you. Whenever I’m with you, I feel my heart skip a beat, my face break into a big smile and my stomach fill up with butterflies — in other words, lovesick. Happy birthday, my love! If you look, you will find romance! Happy birthday, sweetheart! Being in love is something. Being in love with you is everything. With you, I don’t feel the ground anymore. I feel like I'm falling in a bottomless pit…of love. Happy birthday, darling! It's always so amazing to wish “Happy Birthday” to someone I'm so amazingly in love with. Happy birthday, my love! My love for you will never fade away. Say hello to happily ever after. Happy birthday, my love! Our two hearts beat together as one…one amazing, life-changing, refreshing, everlasting love! Happy birthday, my love! On your birthday, more than any other day of the year, you should know just how much the world loves you…and how my love for you is bigger than this world. I'm so blessed to have a love like ours. You're truly the truest love of my life. Happy birthday, baby! Our love is a special gift you and I give each other every day. On your birthday, let’s unwrap our love together! Whenever I'm not with you, I just close my eyes and, in less than a second, I can feel you right beside me. Our love can travel any distance. Happy birthday, lover! Hoping every moment of your birthday is incredible. You’re so special to me and I want your birthday to be so much more special than any other day to you. Happy birthday. Your special day comes only once a year. It should be a once-in-a-lifetime moment...as incredible as our love. Happy birthday, darling! Baby, you rock my every day! Let's make your birthday rock all day and night long to the beat of our love.